Animation layout, effects, and time flies! I really meant to post an update a few weeks ago. I don’t know where the time went these past 5 weeks. I had less time than usual to work on game dev. Our 9 month old son was teething and has also started waking up a lot during the night. That means late nights and being really sleepy. It’s still great, but man it has been rough! The main accomplishments since my last update involve animations and effects. I had to make a bunch of changes to the animation layout for the new troops. I also need to maintain support for the old layout until I have all new assets. That required some new code and it took a bit longer than I had hoped. But now I have the Shadow Knight and Shadow Stalker both in game. They look cool. The Stalker has a bow for her attacks. That also made me realize I will need to add an arrow particle effect as well as control over where it is fired. That way I can line it up with the center of the bow for each direction. I can use that for all of the other troop attacks too so that should look more accurate when I’m done with it. I started making some changes to leader effects too. I decided to make the particle systems more flexible so I now have 10 emitters for the leaders. 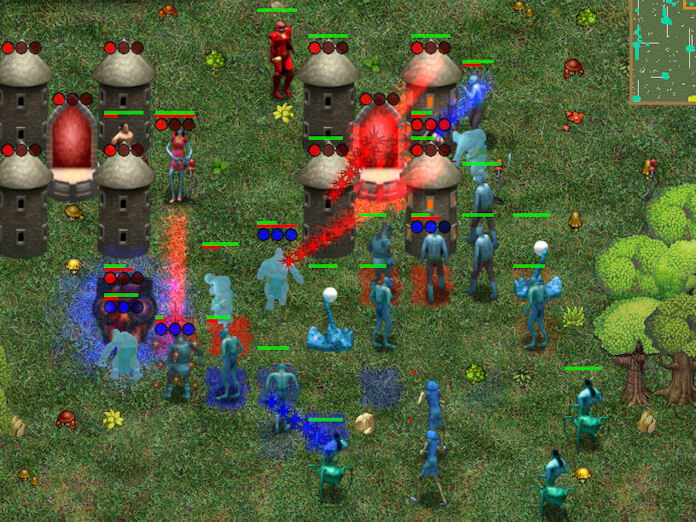 The troops only have 3 emitters, which cover projectile, AoE at target, and a death effect. For the leader abilities, I display a projectile and then cover the area with randomly emitted particles for each of the 9 tiles. Then I display the ability icon over each troop that was affected by it. That way players get useful feedback on what was hit by their abilities. Eventually I will create more intricate effects for each ability, but this works for now. I also had to send the targets from server to client. So I added some code to track those targets, send the ones in line-of-sight for the player to the client, validate them, and display after all update data received. The code seems to be working properly after some quick testing. I pushed back the Internet multiplayer test to December. That’s when I will start to get a better idea of the state of multiplayer, but I’m not expecting any serious issues. A while back I think I mentioned some ideas for guardians. I wanted to share some more possibilities for them. To refresh your memory, fortresses can be upgraded with a guardian once they reach tier 3. It costs power and takes time to summon the guardian. Once it inhabits the fortress, new options become available, such as attacks for the zealots when the banner is destroyed or sacrificed. I have some other ideas that I think could be fun. I was thinking that the fortress could actually morph into the guardian. So the fortifications could change to creature limbs and the portal keep could become the body/head. Then it starts to resemble a boss fight where limbs might each have a different combat ability… sort of like the Quarm fight for anyone that raided in EverQuest. Maybe even players can control some aspects of the fight when defending against attackers? I can think of lots of potentially fun mechanics for that kind of approach. It will really depend on budget (for artwork) and time (for gamplay coding). I will definitely be looking for player input on gameplay ideas like the guardians. Hopefully I can build a community with my future Kickstarter and Greenlight campaigns. I pushed those off to the end of February 2015 to give me some more time to flesh out a few ideas and add more artwork. I will try to update more often. Thanks for stopping by! I also finished my second ALPHA milestone today. This is probably the most important milestone for the game since I now have multiplayer fully working. It was a bit more challenging than I was expecting. The zealots were tough to sync between server and client. I distribute the zealot updates evenly over the process cycles so I don’t stall the game during a spike. That adds another level of complexity for multiplayer since I lose some control over when I update the zealots remotely. That means I need to handle updates coming before and after the current processing on the client. The actual update process on the client runs independently so it runs smoothly. That constraint made it really difficult to catch all of the edge cases. I wanted to automatically update the banner zealots according to the current game state, rather than sending that data. Every time I thought I had all of those cases covered, I would see a sync problem. I ran my server and a client next to each other to discover those issues. I made a lot of fixes during the past month. Now the multiplayer is running smoothly and with no known bugs. I made a pretty big change based on the multiplayer testing. I was thinking about always showing all zealots even when you don’t see them with your troops. The leaders would sense them due to their innate connection to the power resource. I tried it out at first so I could verify the zealots were working for multiplayer. I really liked how it looked, so now it is a feature. The game feels much more alive with them always being visible. It also gives an opportunity to guess what is happening in the fog of war. Next, I will make some improvements to the computer AI when it selects attack targets. There are times when the computer player will pick a target that is just behind another fortress. Then the zealots will never have a chance to reach the target fortress, so the troops get crushed without that support. You normally must send at least one line of zealots to defeat a fortress. More are required if the fortress has strong defenses or its own supporting zealot lines. Essentially, you need to at least have 1 more zealot line linking to the enemy fortress to neutralize the rebuilding and upgrading. I’m going to also make some more changes to the upgrades so there is more depth. I will reveal those details later, as well as some new artwork. Thanks for reading! I just had my first kid on Feb 7th, so I haven’t had too much time to work on Pursuit of Power 2. However, I did get some initial assets and I thought I would share them, as well as a few game concepts. Keep in mind these assets are still in progress, so they will require changes to fix some issues. Plus, the art style is different than the current placeholders, which means they won’t quite mesh until everything matches that style. The screenshot below shows the first round of scenery details that sit on the placeholder terrain. These details are randomly placed when the board is originally created. The tree bottoms and tops are new too. They will be more overhead for the final version. The tree tops will be larger too so the scale is better versus troops. In addition, shadows will be added to tie everything together. I’m planning to make the structures larger than the trees. The detached structures summoned by leaders will be the next largest. The fortress structures will be the largest in game. This will emphasize the importance of the structures as a focal point in the game, while creating a reasonable scale between entities without getting in the way. I will start by making structures semi-transparent so troops are not blocked visually. I will eventually automatically fade-out structures when troops are behind them. After the scenery is tweaked, we will move to working on new terrain that will mesh with the scenery. Then work will begin on the structures, which will include the fortress and detached structures. I felt like the game needed more than just towers for detached structures. Therefore, I added a new type that leaders can summon. This new type will generate auras that benefit allies while being detrimental to enemies. For example, the Shadow Knight could summon a graveyard that generates Dread Aura, possibly adding lifetaps to friendly units and a resistance debuff to enemies, which might even make certain leader abilities more potent. The graveyard could animate floating souls when active. Damage done to enemies within range could feed the graveyard, increasing its potency and tier level over time. Each tier could improve the aura. They would drain when no damage is done, essentially only becoming active during battles in the area. Each leader class would have a unique aura structure. Those are some of the concepts related to the aura structures, which will be revised over time. I found myself summoning towers often in battle and so I wanted to add variety. I think that another summoned structure should add some fun and interesting gameplay options for players while rounding-out the leader abilities. As I get updated assets or new versions, I will share them. I’m going to do more work on the combat abilities and attributes for units. I will share those details too. That’s it for now! It’s taken me a lot longer to update my blog than I had anticipated. I just got married and life got really busy leading up to the wedding! I am starting to get things moving again and will try my best to update my progress more frequently. I did finish most of the code for dynamic scenery. I grabbed some placeholder pieces of trees and created a design that puts those pieces together. The tree placement and other factors are randomized, which makes the trees look pretty varied. I am happy with the result. It will look even better with the production artwork, which will also have much more variety. Speaking of artwork, I am excited to have Mark Jones making the artwork for Pursuit of Power 2! I am currently putting together the design document that describes the assets. There is a lot of artwork going into the game, so it is taking a while to complete. I hope to have it mostly done by this weekend… at least enough to get started in the next 1-2 weeks. I am really looking forward to seeing Mark’s new artwork in the game! Life got busy again. I am now engaged! I also had some hectic weeks at my full-time job to meet release deadlines. I was still able to make some time to work on Pursuit of Power 2. Players can now upgrade fortresses for the different tiers. This includes upgrading the portals and each individual fortification. All upgrades cost power, prestige, and require an idle upgrade timer for the target structure. The only exception is the basic fortification, which does not cost any prestige. Right now the upgrades only affect health for the structures. Eventually, I will add many upgrade options and benefits using a tech tree that is inspired by RPG class design. In addition, I added a lot of the code required for capturing an enemy fortress. I now save the last known player as well as the last known type for each fortress component. This will keep the exploration design consistent since ownership can change while players are not viewing a previously discovered fortress. I also have the code in place for destroying an unprotected portal using a leader ability. Players will also use this ability to purposely destroy a fortification in order to start a new upgrade path for it. As previously mentioned, players would only want to use this option as a last resort. The efficient way to gain new tech is by sharing it between fortresses using zealots. I should have that feature completed within the next few weeks. I am working on some ideas for the fortress upgrades and combat. I think it would be interesting to treat the tiers like encounters in an MMO — solo, group, raid. The solo tier might be possible to kill with a single average creature, group would take a few troops, and a raid would require more advanced tactics. For example, a raid tower could have an upgrade that casts an AoE ability, which requires a player to move friendly troops in the area out of harms way. Thats just a simple example. This would work with the guardian concept too, which could be similar to a raid boss. I’m just not sure if that would be too much tactics in an RTS of this scope, so I will have to experiment with it. For now, I mainly want to wrap-up the major fortress gameplay as well as the guardians. That would take care of the most challenging gameplay features. I’m confident that I can come up with lots of interesting abilities, upgrades, troops, and other gameplay concepts. That’s why I want to focus on finishing the time-intensive tasks as soon as possible. I plan to discuss more details for the fortresses in my next blog post, including the research sharing and capturing by enemy players. Thanks for reading! First, I redesigned some major parts of the game engine to make it easier to add new manager components. I had around 75 files opened for a few weeks while I made the necessary changes. I added a new game manager class that contains most of the other managers and helps simplify some of the code. I put a new resource manager in the game manager. It is responsible for all interactions with resources, which made it possible to add a new gameplay concept. I combined resources, portals, and spawn points into one entity. These resources have a last known state for each player team in order to support the discovery of the resources and a quick way to see the last known state. All resources are now shown from the start of the game and are displayed as orange icons on the game map. Most importantly, the computer players use this same last known state so they are on equal ground with human players. In addition, the resource manager uses the path manager to compute all possible paths between resources. These computations are done asynchronously so they don’t lockup the game during the process. These changes improve the accuracy of the targets that are generated for the computer players. Furthermore, it will make it easier to add the zealots manager, which is the next component that I will add to the game. The zealots manager should really add a fun dimension to the gameplay. I have most of the supporting code ready so adding the zealots will not be too difficult. I will save the network part for later since that will have a few challenging issues. My goal right now is to get the major gameplay coding done so that I can focus purely on gameplay mechanics for the next few months. Then I will work on the code changes for artwork that supports the new gameplay mechanics. While the art assets are being created, I will work on the remaining multiplayer code. I hope to have all of these parts done by the end of the year. During 2014, I will finish the art and sound assets while I create the Alpha, Beta, and Release Candidates. I am on schedule to have the initial release for Pursuit of Power 2 ready some time during December 2014.